Influencing recycling rates by raising consumer and customer awareness. 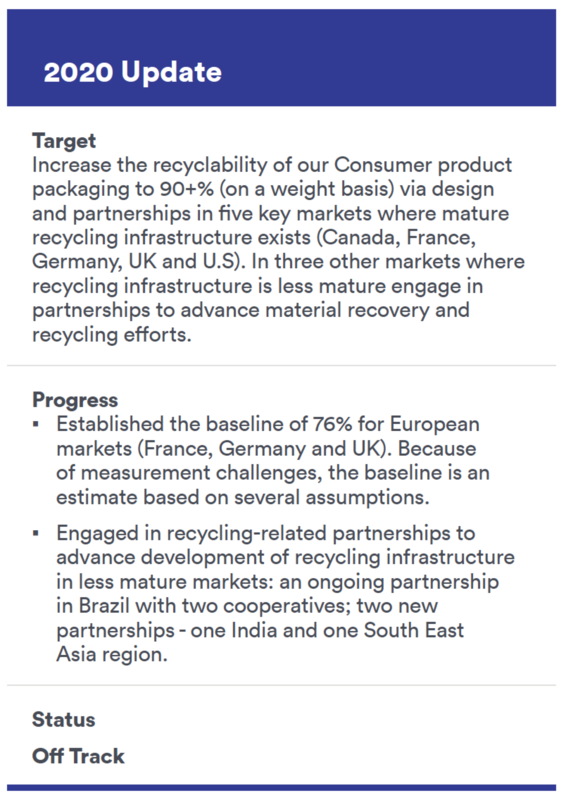 To further develop and scale up sustainable packaging best practices, we made a public commitment to increase the recyclability of packaging in five key markets in the Consumer segment as part of our Health for Humanity 2020 Goals. We are also promoting scalable programs that help people generate value from waste, like Project Phoenix, a program to help recycling cooperatives in Brazil improve their operational processes, develop a stronger social infrastructure, and create a sustainable market for their materials. We are a founding partner of The Closed Loop Fund, a social impact fund that invests in scaling recycling infrastructure and sustainable manufacturing technologies that advance the circular economy in the United States. 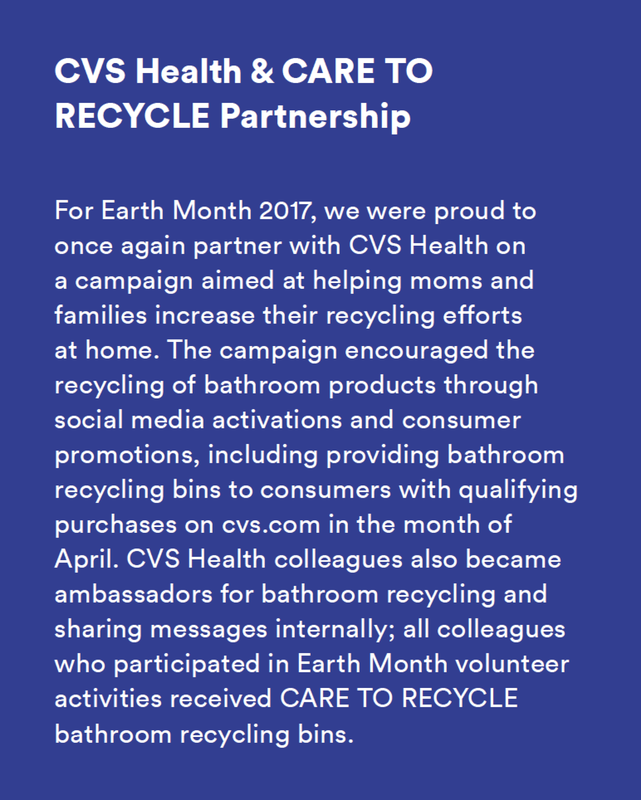 Through our CARE TO RECYCLE Program, we have been encouraging consumers to recycle their personal care products through educational campaigns, tips, and creative engagement programs for four years. We are also a founding member of The Healthcare Plastics Recycling Council, which is helping the healthcare industry create educational materials and support recyclability of plastics in clinical settings. Together with fellow members of the Consumer Goods Forum, we are supporting the Ocean Conservancy Trash Free Seas Alliance’s Signature Initiative in Southeast Asia. This project is focused on reducing the flow of plastic into the ocean from three key industrializing Asian countries – Indonesia, the Philippines, and Vietnam – which account for a disproportionate share of marine plastic. Extended Producer Responsibility (EPR) regulations for medical devices are increasingly introduced in markets around the world. We comply with applicable EPR regulations, and invest in education programs, partnerships and other sustainability initiatives, to advance better management of our medical devices products at end of life. We support and actively participate in many voluntary take-back programs, and we work with our customers to evaluate opportunities to increase the number and quantity of products that can be recycled and reprocessed. For example, the Johnson & Johnson Medical Devices Companies work with health facilities to collect medical devices that otherwise would be bound for landfills or incineration, and reprocesses those devices so that they can be reused by healthcare professionals. Also, our Janssen U.S. business has created the Janssen SAFE RETURNS program for patients using our biologics products at home, enabling them to collect and return used injection devices like prefilled syringes and auto-injectors for disposal. We also participate in several patient-education efforts, including the U.S. MyOldMeds initiative, which helps patients locate disposal options and instructs them on proper disposal methods to avoid flushing.